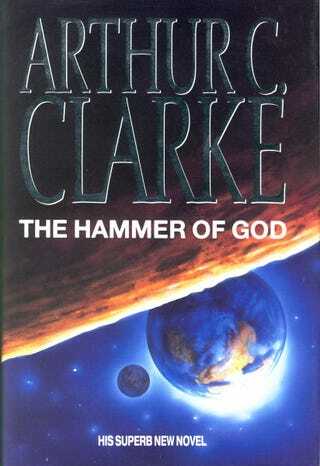 You may have read Arthur C. Clarke's 1993 space-disaster novel Hammer of God — but have you read the original 1992 short story it was based on? Originally published in Time Magazine, that story is now available for free over at Lightspeed Magazine, and it's a potent dose of cosmic wonder. It came in vertically, punching a hole ten km wide through the atmosphere, generating temperatures so high that the air itself started to burn. When it hit the ground near the Gulf of Mexico, rock turned to liquid and spread outward in mountainous waves, not freezing until it had formed a crater two hundred km across. That was only the beginning of disaster: Now the real tragedy began. Nitric oxides rained from the air, turning the sea to acid. Clouds of soot from incinerated forests darkened the sky, hiding the sun for months. Worldwide, the temperature dropped precipitously, killing off most of the plants and animals that had survived the initial cataclysm. Though some species would linger on for millenniums, the reign of the great reptiles was finally over. The clock of evolution had been reset; the countdown to Man had begun. The date was, very approximately, 65 million B.C.